i.e. and . As it is well understood, because of `errors' we do not observe directly and , but experimental quantities2 and that might differ, on an event by event basis, from and . The outcome of the `observation' (see footnote 2) for a given (analogous reasonings apply to and ) is modeled by an error function , that is indeed a probability density function (pdf) conditioned by and the `general state of knowledge' . The latter stands for all background knowledge behind the analysis, that is what for example makes us to believe the relation , the particular mathematical expressions for and , and so on. Note that the shape of the error function might depend on the value of , as it happens if the detector does not respond the same way to different solicitations. A usual assumption is that errors are normally distributed, i.e. where the symbol ` ' stands for `is described by the distribution' (or `follows the distribution'), and where we still leave the possibility that the standard deviations, that we consider known, might be different in different observations. Anyway, for sake of generality, we shall make use of assumptions (5) and (6) only in next section. (Obviously, among the several possible ones, we choose the factorization that matches our knowledge about of physics case.) At this point let us make the inventory of the ingredients, stressing their effective conditions and making use of independence, when it holds. Finally, and are usually independent and become the priors of the problem,3 that one takes `vague' enough, unless physical motivations suggest to do otherwise. For the we take immediately uniform distributions over a large domain (a `flat prior'). Instead, we leave here the expression of undefined, as a reminder for critical problems (e.g. one of the parameter is positively defined because of its physical meaning), though it can also be taken flat in routine applications with `many' data points. The constant value of , indicated here by , is then in practice absorbed in the normalization constant. 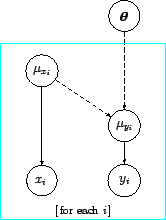 Figure 1: Graphical representation of the model in term of a Bayesian network (see text). where we have factorized the unnormalized `final' pdf into the `likelihood'5 (the content of the large square bracket) and the `prior' . and the constant factor , irrelevant in the Bayes formula, is a reminder of the priors about (see footnote 5).